Don’t take that too literally – of course you need more than avocados to regain and maintain your bone health, but regular consumption of avocados is certainly a step in the right direction. Can you believe that avocados were once thought of as a tasteless food? It’s true. Although avocados have been cultivated in Central and South American since around 8,000 B.C., early Aztecs used avocados more for their healing properties than their taste. I find it amazing that anyone could think avocados don’t have an amazingly rich flavor! Vitamin K, which works in synergy with Vitamin D to help regulate osteoclast production (osteoclasts remove old bone to make way for new bone deposits). You can read more about this important nutrient in “Vitamin K: Your Osteoporosis Knight in Shining Armor”. Vitamin C, a potent antioxidant that’s crucial for the production of collagen, a protein that maintains – among other things – healthy bones and cartilage. Boron, a trace mineral involved in bone metabolism and Vitamin D activity that reduces the amount of urinary calcium and magnesium excretion. Copper, a multi-tasking mineral present in an enzyme that produces collagen and elastin. Folate (folic acid), one of the B vitamins. In today’s society, most diets contain way too much sodium. Avocados are an excellent source of potassium, which is essential for balancing sodium intake. And one cup of sliced avocado contains over 7 grams of fiber! They’re also a source of Omega 3 fatty acids, – yet another Foundation Supplement – which offer many health benefits, including increasing calcium absorption and deposition. And despite the common perception that carotenoids are found mostly in carrots, tomatoes, and other orange and red vegetables, avocados are a fantastic storehouse of potent antioxidant carotenoids including lutein, beta-carotene, and alpha-carotene. Have you been avoiding avocados because you think they’re too high in fat? Well, you can put that myth to rest. Avocados do have a high fat content – in fact, that’s the reason they’ve been given the nickname “butter pears” in some circles. But most of the fat in an avocado is monounsaturated. That’s the “good” fat that’s been shown to lower cholesterol levels and provide numerous other health benefits. Even if you’re watching your weight, there’s room for avocados in your diet. When you have the urge to spread butter on your toast, try adding a bit of mashed avocado instead. Cut the avocado in half (lengthwise) with a stainless steel knife. If the pit doesn’t want to come out, just give the two halve a bit of a twist in opposite directions. Slice each avocado half lengthwise, so you end up with four slices. With your thumb and index finger, just peel the skin away from the flesh (just like peeling a banana). Voila! A neatly peeled avocado that retains most of the flesh closest to the skin, the part that has the most antioxidants. Look for avocados that are just slightly soft to the touch, but avoid any that have cracks or sunken, discolored areas. If you’re not going to use the avocados right away, you can buy firmer fruits and let them ripen at home. An unripe avocado will usually ripen in a few days; if you’d like to speed up the process, simply put it in a paper bag. You can keep a ripe avocado in the refrigerator for about a week. 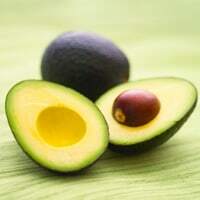 It’s best to cut avocados only when you’re ready to use them, as the flesh starts to brown when it’s exposed to air. Tip: Sprinkling an avocado with lemon juice delays the browning process. To store a cut avocado, sprinkle the surfaces with lemon juice and wrap it. This Hodgepodge is a Treat! The following recipe is one of my favorite ways to enjoy avocados. It’s almost 100% alkalizing – the only acidifying ingredient is the cheese. Toss all the ingredients together and enjoy. Keep spoiling your taste buds… and nourishing your bones! I have a Vit. D deficiency and have had high triglycerides since I was a child (hereditary). I began adding avocados to my meals weekly and actually crave them as a snack. My recent lab work showed that my vit. D levels went up to normal and my triglyceride levels went down a lot. I do believe adding avocados to my diet helped this change as I never ate them before. I always pay attention to what I eat and the correlation in my blood work. Interesting, Cindy! It’s great that your health is improving while you’re enjoying avocados. I’m very interested in the actual value of the vitamin content of avocados. I noted that the USDA database says that avocados have zero vitamin D in either form. Do you have more recent information? Can you give me the citation? Thanks! I would like to know if it’s true you can smash avocado seed, mix them in wine, and them have a spoon every night. I read that on another web site, saying it’s good for RA. Thank you. do you know there is a machine call juventa is good for osteoporosis. Actually, It’s called a Juvent 1000 Published studies show it’s quite effective. I bought mine years ago, but haven’t been able to use it much because of bad neck problems. It was NASA approved for astronaut osteoporosis at one time. Vivian , I wish I could join in more often but as you probably realize when your on medicare & social security you don’t get a lot of money & its hard to find health insurance that is affordable. I’ve got osteoporises , I’m not spelling this right ,so please bear with me ,I recently came across a lady on the web site : bestrong4life.com. – said there helping people with what I’ve got -please look it up & let me know what you think. You can build your bones up again by using a machine that the astronauts use when up in space. some sort of vibrations along with exercise. That’s great news Debbie … I’ve often wondered if avocado can be frozen – and have let too many go off. I’ll definitely be eating more avocados now 🙂 – and storing them for later, too. A recipe that I was shown some time ago – was to cut the avocado in half remove the stone – and fill the hole with fresh lemon juice and eat :). Delicious. Very good information for us senior people. Thanks for the tips about avocado. It’s one of my favorite fruits. Not sure if this is where I should ask a question: I had a compression fracture in my spine 2 years ago at age 65. I’ve never had a bone density test, but am trying to prevent further fractures with your “Save Our Bones” program. Unfortunately, I have a high frequency of migraines & have to take 50 mg. of Imitrex 2 or 3 times a week. I also take quite a bit of Excedrin for pain. Will the Imitrex increase my chances for Osteoporosis and further fractures. Thanks alot. I read this just as I was preparing a packed lunch, including guacomole. Now I know avocados are good for my bones I’ll enjoy it even more! avocadoes 1 – 3 a week depend on its season. analyze the nutrition and good for our bones. I like the comments about avocadoes, I can eat them everyday; but I limit it to two a week. Thank you Vivian for the info and for caring about us; God bless you. I’ve joined the Save Our Bones program and have a few questions. Are the following good to use: Agave Nector; Xylitol; powdered nonfat milk made with distilled water and Green Rooibos tea made with distilled water? I cut up an avocado, tomato and onion; add a little salt, pepper and olive oil. Love this and have been using this as my salad with lunch or dinner – or many times by itself as a light meal. Thanks so much Vivian for putting recipes out there for us and not just saying how healthy something is, but showing us how to incorporate it into a recipe. Hope you have a recipe book out soon. I quit taking all “bone density” meds about 8 months ago. I work out 5 days a week (senior aerobics) but have a constant pain in my left hip. It doesn’t hurt much when exercising but mostly when I stand up after sitting. Any thoughts on what this is? thank you for your e-mail and the Avocado recipe,I will try it. my coments are your work is very good, excellent. Thank you, and kind regards may the GOOD LORD WILL BLESS YOU WITH GOOD HEALTH AND LONG LIFE TO CONTINUE HELPING OTHERS. Your Article Is Letting Me See The Avocado In A Whole New Light. Your Recipe Sounds Delicious. I’ll Have To Give It A Try! Thank You VERY MUCH For Sharing It With Us, And For ALL YOU DO! This is great information. Thank you, Lillian. Love all these suggestions folks. Have you tried a little Balsamic vinegar over avocado? Delish! Love them with ground black pepper too, so mant ways to enjoy this delectable fruit! I simply don’t like avocados. How much value is there when mixed with something else and with what? LaVonne, if you don’t like avocados (or any other food I talk about), don’t worry about it! You have a wide variety of foods to choose from on The Osteoporosis Reversal Program. When I talk about the benefits of a particular food, it doesn’t mean you HAVE to eat it to be successful on The Osteoporosis Reversal Program. Whizz in a processor until smooth. Yum! I love getting your emails Vivian, thank you so much for taking the time to help us, they’re so informative. I spent £2000 on a Juvent vibration machine but it hasn’t made any difference after 2 yrs use to my bone density (in fact it’s got worse). What’s your opinion on these machines? I’m 57. I am 82 years old and I have been taking Aleve for about three years for knee pain. I stopped taking them for about three days and I can hardly walk. Do you have any suggestions. I love reading your articles. Thank you so much for all the research that you do and sharing it with others. dorothy, I am almost 56. I had been having a lot of knee pain when trying to walk up and down steps. I did a juice fast for 30 days and then began a plant based diet. My knee pain is pretty much gone. Dairy and meat is very inflammatory. You could try taking Glucosamine and Chondroiton tablets (a famous ballerina takes these) and I have tried it in the past and they work, but not right away, along with Cod Liver Oil for your joints, and also eat anti-inflammatory foods. These tablets also come in the form of an ointment to rub on the affected areas. I would strongly suggest that you see your Dr. right away and request a knee joint x-ray. It sounds like you may have osteoarthritis in that knee joint and could benefit by knee replacement surgery. Your knee joint will only get worse and more painful over time. Unfortunately, there are no safe pain killers for arthritis! I appreciate your informative emails very much! I look forward to receiving more in the future. ty, I am eating more avocado and trying to get friends to try them. It is served in a lot of dishes when we eat out and I order these dishes so they can see how it used and how it taste. I love the tips on food and on vitamins. But there are so many vitamins we need to take I would like to know Vivian which supplements you take and where you get them. Can you find a multi-vitamin or multi-mineral with most of the vitamins in it that we need and not have to take a handful of pills a couple of times a day. I am doing great staying on the alkalizing side of things, but I wonder about my vitamins. Thanks for all your help. Can’t wait to see if my dexa has improved. I do not have to have one for 2 year so am looking for improvement. I would like to know exactly which supplements and minerals are best to take. There are so many listed. Is there one which is particularly good and has all required supplements/Minerals. Quoting Bettie above I too would like to know ‘which supplements you take and where you get them. Can you find a multi-vitamin or multi-mineral with most of the vitamins in it that we need and not have to take a handful of pills a couple of times a day’ I have just received your book and I am thoroughly enjoying it. You have made it so positive, uplifting, helpful and easy to read I am a happier person now. I also have backing when dealing with my GP. Thank you. You can make avocado smoothie. Get three avocado. Cut them in lengthwise and take the seed out. Scoop the avocado in the blender. Next get some crush ice and put some honey to sweeten the mix. Put a half glass of almond milk. Mix all the ingredients until the ice finely chopped. And ready to drink. Thanks so much for all these suggestions!! As a dip, I like the avocado mashed with red tomatoes, onion, and cilantro. : ) i was just thinking the same as mieke after reinadg your words claudia. I now have 5 pits that i can put in water an there is also a small one, I will try it and see what will happen. but it is strange my first avocado was a very big pit and also after a few days it had cracks and after two weeks already long roots : ) but then my second was also a big pit and it was for months before something happened, so a small pit i will try, and we will see what happens. Thank you Vivian–I have taken every day half of an Avocado with a little sauce and a small glass of red wine before dinner, Yummy- My cholesterol came down too. We have a lot of different Avocado’s in Australia.Some are out of season and you buy another one. Good to know they are good for the bones. Try to take also Coconut oil but not sure if that is good for the bones too. Please let me know.Seems to be very good for a lot of things even for Parkinson. Thanks so much . Illya, coconut oil has saturated fat, but research has proven that it is a very healthy form of saturated fat, and is mostly medium chain triglycerides (MCTs) including lauric acid, which supports a strong immune system. I don’t see any problem with it. Heavenly crunch munch! Wow, love it, made it immediately and still making it, so moorish, thanks Vivien. Rub the inside of the avocado skins on your face. Its a wonderful moisturising cream.